As soon as the final snows of winter have melted away, the avid gardeners among us (you know who you are!) are immediately rarin' to start digging away in their gardens. Here are some veggies you can plant in early spring that can handle the cold! Roses are the flowers of poetry; fragrant and lovely amidst the thorns that guard them. 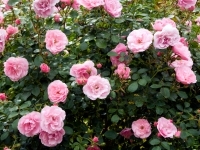 There are many varieties of roses for gardeners of all different experience levels. You want your landscape to be interesting and beautiful in all seasons. This can seem difficult here in Niagara, but you can accomplish it by choosing plants that have features that are pleasing in each season. In today's blog post, the Country Basket Garden Centre team offers up some tips and advice for planting beautiful, hardy perennial gardens in Niagara. Though annual flowers must be planted new every year, they provide a blast of colour all season long that's truly worth the effort. The Country Basket Garden Centre in Niagara Falls features a beautiful on-site Flower Boutique, where we offer everything from custom Wedding flowers and Celebration of Life arrangements, to hand-tied bouquets, ready to go every day.